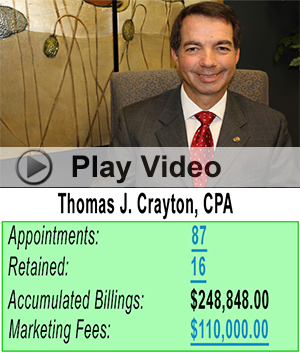 Thomas Crayton, a Certified Public Accountant based in Stafford, Texas, has collected more than $248,000 over a three and a half year period from clients he has obtained from GoodAccountants.com since September 7, 2011. Crayton, who has paid GoodAccountants.com a total of $110,000 in marketing fees over the same three and a half year period, now collects $120,000 each year just from clients he has obtained from GoodAccountants.com. Along with the cash he will collect this year his total collections will surpass $368,000 for his original $110,000 investment with GoodAccountants.com for clients they have referred to him. Getting back almost three and a half times your original investment inside of a four year period is a great investment as any seasoned investor will agree, however for Crayton, it’s only the beginning. “There are statistics out there that show that accountants hold onto their clients for an average seven year period,” says Crayton. If this rule holds true for him, then Crayton’s total cash take on his initial $110,000 investment will hit $770,000. So how disruptive is this to today’s accounting industry? “Very disruptive,” says Crayton. “Why would you buy someone else’s practice where you will lose as much as seventy percent of those clients within the first year when you can double your investment in the first year with GoodAccountants.com from clients that have selected you to be their accountant,” quips Crayton. According to Johanna Laurent, President of GoodAccountants.com, many accountants who have been members of her nationwide network for the past three or four years are now approaching accumulative cash yearly collections ranging from several hundred thousand dollars per year, right up to as much as a million dollars a year from clients her company has referred to them. “When you look at some of the videos of accountants in our network saying they’ve made thirty or forty thousand dollars within months of joining GoodAccountants.com that’s not the real story that should be focused on,” says Laurent. “The real story is the residual income that accounting professionals are earning from the clients we refer to them which can be as much as hundreds of thousands of dollars per year within a few years of joining our network,” she explains. Crayton says he owes a debt of gratitude to another accountant based in Oklahoma City who is a member of GoodAccountants.com whom he called up for a reference about the company when he was first approached by Stephen Mack back in 2011 concerning a prospective audit client. “Had she not told me about her own success with GoodAccountants.com, I probably would not have joined,” says Crayton. “I’m so glad I did,” he adds. GoodAccountants.com guarantees $50,000 in first year client billings for a $25,000 investment in one of its marketing programs. For more information about becoming a member of GoodAccountants.com please click here.